Went to The Cell Theater in New York tonight to see a panel discussion of the book on the left. 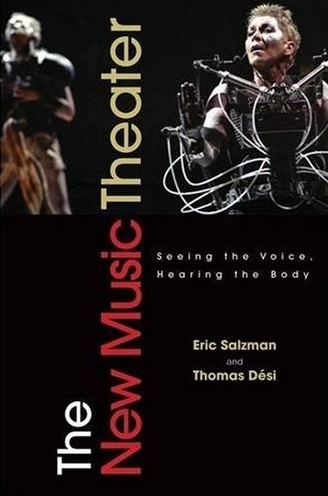 Eric Salzman also wrote Twentieth Century Music, which many of us read as children, and this latest is coauthored by Thomas Desi, whom I met at NewOp, I think in Amsterdam, which is how I met Eric as well. 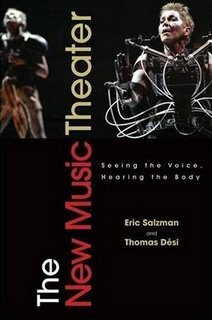 Eric and Thomas are both talented composers and impresarios, and the book looks great. It's waiting for a read after The Piano Teacher. Afterwards, dinner with the two authors and Grethe Holby, who danced in Einstein and started American Opera Projects. Eric doesn't like using "opera" or "chamber opera" for what we all do, as he thinks it carries too much baggage and too much of a connection to the opera singer voice of the 19th century. "Music Theater" is his preferred term, although I think that term is usually confused with American Musical Theater, and I kind of like taking back the Opera word. It sounds highfaluting and pompous but it's all meaningless to the person on the street anyway.